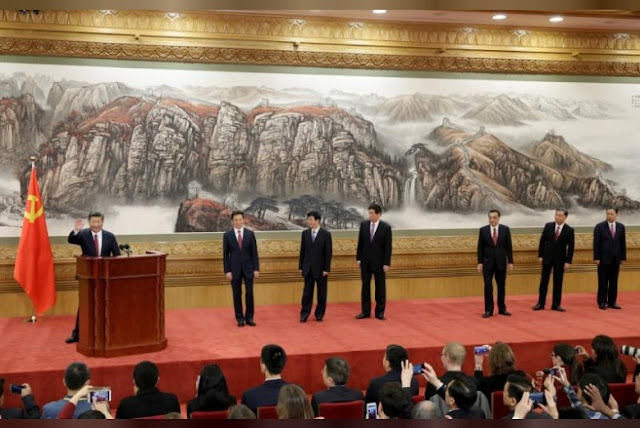 China's President Xi Jinping (L) waves after his speech as he and other new Politburo Standing Committee members meet with the press at the Great Hall of the People in Beijing, China October 25, 2017. BEIJING - Every time China’s ruling Communist Party convenes a major gathering, like the congress that just ended in Beijing, the list of delegates is hand-crafted in part to burnish the party’s image as “representative of the masses” - including giving some prominence to those in more menial jobs and ethnic minorities. The founding father of communist China, Mao Zedong, may have once said that women “hold up half the sky” but when the twice-a-decade party congress selected a new batch of top leaders this week, females weren’t holding up much at all. One rung down, just 4.9 percent of the new Central Committee, a mere 10 of the body’s 204 members, are women. That number was unchanged from the outgoing Central Committee, which presided for five years, but lower than in 2007-2012 when there were 13. The State Council Information Office, which doubles as the party’s propaganda department, did not respond to faxed questions for comment on why there are so few women in senior party positions. By way of comparison, five members of U.S. President Donald Trump’s 24-member cabinet are women, and about 20 percent of the U.S. Congress are female. In Japan, two out of 20 members of the cabinet are women as are about 10 percent of the lower house lawmakers newly elected on Sunday. But with most senior leadership posts in the hands of men, activist Xiong Jing, an NGO project manager who edits a feminist social media site, said many of the women delegates to the party congress were there merely as “decoration”. At party congresses and annual sessions of parliament, there are delegates from China’s 56 different ethnic groups, every branch of the military and police, private businesses, the state sector and, of course, the government. The party congress this year featured delegates who were astronauts, athletes, actors, judges, farmers and more. There was even a delegate representing housekeepers, who showed up in her apron and maid’s cap. For women in general in China, political empowerment is lacking. China ranked 74th in political empowerment of women out of 144 countries in the World Economic Forum’s global Gender Gap Report last year. In 2006, it was no. 52 out of 115. Leta Hong Fincher, a New York-based sociologist and author of the forthcoming book “Betraying Big Brother: The Rise of China’s Feminist Resistance”, says women in China are losing ground amid a resurgence of traditional gender norms. “It’s my impression that the Communist Party is fundamentally not interested in having women at the senior levels at all,” she said. In China’s pre-reform command economy under Mao, women were drafted into the workforce and recruited into nation-building. The most powerful woman since the communist takeover in 1949 was Mao’s third wife, Jiang Qing. She and members of her “Gang of Four” were arrested after Mao’s death in 1976 and blamed for the excesses of the chaotic Cultural Revolution. More recently, Hong Fincher says, the party has been spooked by China’s demographic challenges - an aging population, shrinking labour force and falling birth rates - and has aggressively promoted the idea that women should be getting married and having babies. Every time China’s ruling Communist Party convenes a major gathering, like the congress that just ended in Beijing, the list of delegates is hand-crafted in part to burnish the party’s image as “representative of the masses” - including giving some prominence to those in more menial jobs and ethnic minorities. Yet one group is chronically under-represented among the political elite: women.